After hundreds of years (or possibly thousands), the world of tattoo art is finally becoming a legitimate art form with the star foot tattoo design as one of its most popular. The star has been a popular tattoo since the beginning of modern tattoo art. The idea of the star began with the early sailors and pirates as a nautical star. The nautical star tattoo is probably the most widely known of all tattoos. The sailors would have the star placed on their hands as a way to be granted good luck not just on their journey at sea but in their journey in life. The nautical star has since become a symbol surrounded by controversy due to the groups who have adopted it. Other groups, like the punk movement, use the star as a means to show their unity to each other and to identify themselves as a "true" punk. The punk movement adopted the star as a sort of tribute to a tattoo artist from the days of piracy by the name of Sailor Jerry. Military personnel have taken to having the star tattooed on their hands and forearms as a good luck charm to symbolize protection and to point their way home. 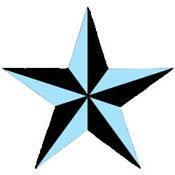 The North Star is also a popular variation on the nautical star but is more widely used these days as a cultural symbol of the gay and lesbian community. The shooting star pattern often found in tattoos on the foot is a derivative of the nautical star design used as the main component in the finished shooting star designs, incorporating two star concepts. Not every star foot tattoo has to have an underlying meaning. It is possible that someone just thinks the design is cool and that the style will always remain "in." For as long as the night sky shines over the Earth the image of a shooting star will always remain somewhere in popular culture as an everlasting beauty. Women typically prefer the shooting star pattern as many men consider it "girly" and will opt for something more horrifying. Women appreciate the beauty more (or at least can show their love for it better) and the majority will have it placed on the foot but will also consider other locations like the back or ankle. The shooting star has always been the sign of dreams coming true. You see a star fall and you must make a wish within a few seconds or you will blow your chance. Many celebrities have begun to find a great love with having star tattoos. Kate Hudson has a shooting star pattern on her foot, for instance. Tennis star Anna Kournikova also has a star tattoo. Other celebrities and athletes sport many tattoo designs that can either be seen or are cleverly hidden but the influence that a celebrity holds on the general public is staggering to the point where fans will often get tattoos that match. The sky is the limit when you are designing your tattoo. Take the time to come up with something that you like and it is always in your best interest to tell that tattoo artist a little about yourself and what you want your ink to represent. A good artist will be able to take this information and conceptualize it for it within the price range you are shooting for.